The fall closure of Pal-Do World in Lynnwood may not be news to you, but it certainly was to the young couple who drove up to the place early this month, took a look at the note on the door and headed right back to their car mumbling #@$%! in Korean. Indeed, I felt their pain. But rather than sit quiet with those feelings, as I did, I should have said, “Hey, wait a minute! Get back here! The food court is still open for business!” Which is why those front doors were unlocked. The shelves at Pal-Do World in Lynnwood are barren, but there’s still action inside for the hungry. Had they stepped inside they’d have found Diana and Andrew Choi ready to hook them up with a warming cauldron of soondubu (among other deliciousities) at their popular cafe, Cho Dang Tofu. What’s more, the Choi family is still serving their famous KFC (that’s Korean fried chicken), prepared next door at their adjacent kiosk, Chicky Pub. There you’ll find Kang Min Choi, Diana’s husband and Andrew’s dad, who wasn’t too keen on posing for my post. But you shouldn’t be shy! Get over here: Chicky Pub remains open for eating in or taking out, for now, at least — though there’s some talk among the family of casting their eyes elsewhere, depending on how things shake-out up here. According to the Chois, new owners are supposed to be taking over, re-opening in February with all-new inventory as another Korean shopping destination. Snohomish County legal records show that Pal-Do World in Lynnwood is in receivership. And after chatting with Pal-Do World managers and employees in Federal Way, Lakewood and Bellevue, I learned that each of the stores is individually owned, licensed to use the Pal-Do World name and still in business. Funny, it seems like only yesterday that the Lynnwood Pal-Do World opened to a receptive audience, but I have to admit: even I had thrown the place over for that nearby newcomer, H Mart. (Shame on me!) Anyway, it’s too bad I was on my way to my neighborhood sushi bar the other night, or I’d have opted for a dish so delish it was profiled in Gourmet. Come and get it! Too lazy to make fried chicken at home? Looking for something (far) better than your neighborhood supermarket chicky? 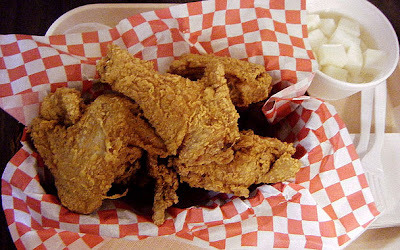 Chicky Pub’s fried chicken is available to eat in or take out daily here at 17424 Highway 99.